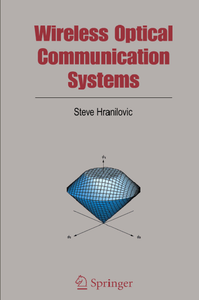 Wireless Optical Communication Systems addresses the problem of designing efficient signalling and provides a link between the areas of communication theory and modem design for amplitude constrained linear optical intensity channel. Topics include historical perspective, channel impairments, amplitude constraints and the characteristics of popular optoelectronic components. A variety of wireless optical channel topologies are presented along with a survey and analysis of present day signalling techniques employed for these channels. The author provides a unifying framework for signalling design which allows the channel constraints to be represented geometrically and permits the use of modem design principles from electrical channels. Modulation schemes are designed using the formalism of lattice codes and a design process for signalling sets is specified. The use of multiple-input/multiple-output (MIMO) wireless optical channels to improve the spectral efficiency of links is explored. The basic spatio-temporal modem design problem is specified and a spatial multiplexing gain is quantified. New spatial discrete multitone modulation is proposed and the unique features are discussed. Based on measurements on an experimental prototype, a channel model is formulated and a realizable spatio-temporal coding scheme is simulated to quantify performance gains. This volume is organized for professional and academic readers engaged in modem design for wireless optical intensity channels. Significant background material is presented on both the properties as well as on fundamental communications principles. Wireless Optical Communication Systems can be used by physicists and experimentalists as an introduction to signalling design as well as communication systems designers.